﻿It is widely known that Sonny Stitt didn’t want to be taken for Charlie 'Bird' Parker and changed from playing the alto to the tenor saxophone. Although false rumours pop up every now and then, the truth is that at the beginning of the 1940s Stitt independently developed the same be-bop licks as Parker without ever having heard him. 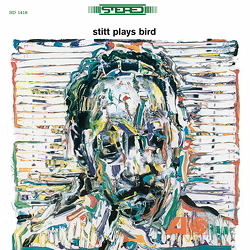 For "Stitt Plays Bird" Sonny had to unearth his old instrument and insert a new mouthpiece because Atlantic Records and their entrepreneurial president Ahmet Ertegun hoped for big sales figures. Which actually proved true. One half of the modern jazz quartet provided the melodic and rhythmic basis for improvisations on eight 'hits' by Charlie Parker and one composition by his first employer Jay McShann. Added to this are the subtle, sensitive scatterings from Jim Hall and the emphatic beat from Richard Davis, both of which lend delicacy and pulse to the numbers. It’s hard to recommend a special track, but "Scrapple From The Apple" is just awesome! All the numbers are based on standards – just which they are can be found in the informative liner notes by the be-bop expert Ira Gitler. Atlantic’s logo “Full Dynamic Frequency Spectrum” is no longer a swindle in this new pressing and at last one can enjoy all nine titles in all their sonic glory.